Highfield Leadership Academy in South Shore has been placed into special measures after being rated 'inadequate' in all areas. It comes after the secondary school's first Ofsted inspection since controversially becoming an academy on the orders of the government three years ago. Inspectors from the education watchdog turned up unannounced recently and said they uncovered a number of failings, including a quality of teaching that "falls far short of being acceptable", leaders who have "an overgenerous view of the school's effectiveness", a problem with bullying and bad behaviour, and progress which was described as "among the worst in the country", with youngsters in years 10 and 11 were found to have "underachieved significantly in most subjects, including English and mathematics". Progress made by disadvantaged pupils, the most able pupils, and boys, was found to be "exceptionally poor", with attendance and punctuality also flagged up. While 16 weaknesses were highlighted in the report, only two strengths were given: Senior staff with a "strong sense of moral purpose" facing "substantial obstacles" and working "tenaciously to overcome" them, and "many" pupils - described as "polite and friendly" - wanting to "do well". Parents will be given a letter outlining the findings this evening ahead of the report's publication on Friday, The Gazette understands. Shirley Gornall, executive director of qualify assurance at Star Academies, which runs the Highfield Road school, said: "We do not believe the behaviour observed by Ofsted inspectors was typical of the hardworking and respectful pupils in our school. "The inspection came at the end of a difficult term when we were not in a position to present the school in its best light." The team of inspectors, led by Emma Gregory, looked in on lessons, examined work, met with staff, spoke with trust representatives and governors, conversed with parents and pupils, observed behaviour outside of class and before and after school, and considered documents including self-evaluation forms, on December 11 and 12 last year. The inspectors received no responses to a staff survey, but considered 74 responses to online questionnaire Parent View, including 10 written responses from parents to Ofsted's free text facility. Ofsted said in its report the "chief inspector is of the opinion that this school requires special measures because it is failing to give its pupils an acceptable standard of education, and the persons responsible for leading, managing, or governing the school are not demonstrating the capacity to secure the necessary improvement in the school". A list of improvements that should be made "urgently", "immediately", and "rapidly" was given to the school. There should be a crackdown on "discriminatory behaviour and bullying", while steps should be taken to "challenge and eliminate the poor and disrespectful behaviour or some pupils". Action is needed so pupils "are confident staff will listen to them and take their concerns seriously", and are "confident teachers will deal with incidents of bullying, including homophobic bullying, effectively". And work is required to ensure senior staff "have an accurate view of the quality of education the school provides", with the report saying: "Senior leaders are overly optimistic about the quality of education pupils receive. "It is leaders' view they have made some improvements since the new school opened in April 2016. However, senior leaders underestimate many endemic weaknesses that are clearly apparent. "For instance, leaders believe pupils' behaviour is good. The judgement they had made about this aspect of the school is inaccurate. It contradicts the evidence gathered on inspection, including the opinions of many pupils and staff who spoke with the inspection team." Ms Gornall said: "We are proud of the achievements of our young people and school over the past three years. We have secured much improved GCSE results, attendance, and behaviour. "In addition, our pupils have engaged in hundreds of community projects, delivering thousands of hours of volunteering and raising thousands of pounds for charity. "Despite these improvements and proud achievements, we recognise there is a long way to go and a lot of hard work before we get to an acceptable standard of learning for all of our young people. "We will continue to work hard to ensure the recommendations in the report are implemented. We are in no doubt our children deserve better and will leave no stone unturned to deliver for them." Highfield was told to become an academy after previously being rated as 'inadequate', and was the last secondary school in the resort to convert three years ago. Star Academies, then Tauheedul Education Trust (TET), was chosen by governors, despite concern from parents, who launched an action group and said the move had caused "great concern in the local community". One, whose daughter has now left Highfield, said today: "The school is doomed while it's under the management it is under. Two years ago, we banged on about how things were suffer and now it's been proven correct." READ MORE:: Highfield was ordered to become an academy after being rated 'inadequate' - so what happens now? Lynette Norris was tasked with turning the fortunes of Highfield around after being brought in in September 2015, shortly before it was announced Star would be taking over after years of under-performing. It was rated 'satisfactory' in 2011, 'requires improvement' in 2013, and 'inadequate' in 2014. 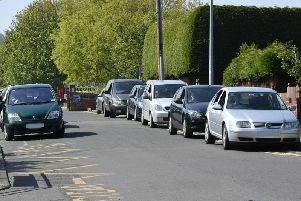 The school, which according to Ofsted has 857 pupils but has capacity for around 1,200, remained in special measures after inspectors became so concerned about pupils' behaviour at a follow-up visit they ordered senior teachers to write an action plan before they left. Their tour of the school came after teachers called in police when up to 200 pupils were described as being out of control, after a spat between two schoolboys led to a crowd of youngsters chasing each other. In February 2016, "significant water damage" was inflicted on the school after an arson attack set off the sprinkler system. Firefighters were called after a toilet roll dispenser in a second floor boy's toilet was set alight. The fire saw pupils sent home and the school closed for the day." Ms Norris left the school in 2017, saying at the time: "It has been an honour and a privilege to lead Highfield over the past two years and throughout the conversion with Tauheedul Trust - it has certainly been an interesting one as well." Louise Riley then had a spell as head, before Andrew Galbraith took over last month. Executive principal Helen Mackenzie also left her role last month due to ill health, parents were told in a letter. Highfield will now have to demonstrate it is improving, with Ofsted set to return for a number of monitoring visits over the coming months. Blackpool South's Labour MP Gordon Marsden said: "I'm now looking carefully at this report. It's clear that there have been major problems and deterioration in many aspects of the school since the summer of 2018. "I had detailed discussions about this situation in December at around the time of the inspection and have done the same with the council, both then and since." A Blackpool Council spokesman said: "We are obviously disappointed at the outcome of this inspection. Star Academies has a strong record of delivering improvements in secondary and primary schools across the UK.